↑ A eulogy gives his age as 68, and on that basis Grove gives a birthdate "almost certainly between 3 February 1525 and 2 February 1526" (The New Grove Dictionary of Music and Musicians, 2nd ed., s.v. "Palestrina, Giovanni Pierluigi da" by Lewis Lockwood, Noel O'Regan, and Jessie Ann Owens[page needed]). ↑ 2.0 2.1 2.2 2.3 Jerome Roche, Palestrina (Oxford Studies of Composers, 7; New York: Oxford University Press, 1971), ISBN 0-19-314117-5. ↑ Brink, Emily; Polman, Bert, eds. (1998). The Psalter Hymnal Handbook. Retrieved 26 January 2015. 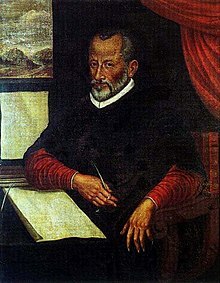 "Giovanni Pierluigi da Palestrina". University Musical Encyclopedia. New York: University Society. 1912. "Giovanni Pierluigi da Palestrina". Catholic Encyclopedia. 1913.